The obesity epidemic in the U.S. today spans beyond just a need to pay better attention to what we eat while also being more active. Because these tasks have proven difficult to achieve for so many of us, modern technology is now creating tools to help in the fight. While more extreme measures like surgeries and diet pills are a solution for few, not just anyone can turn to those options. To make it easier, and safer for anyone to get their weight in check, mobile technologies focus on the age-old, proven method of ‘eat less, move more’ – in a more modern way. There are an overwhelming abundance of websites that offer tools to track one’s food intake, or find information on healthy foods and methods to cook them. Now, with just about everyone owning a smartphone, and apps becoming more sophisticated, it’s even possible to quickly track and journal food intake as well as how many calories a person is burning throughout the day. A recent study from ABI Research found that GPS-enabled health and fitness products are growing strongly and application downloads are expected to shatter the 100m mark in 2012. 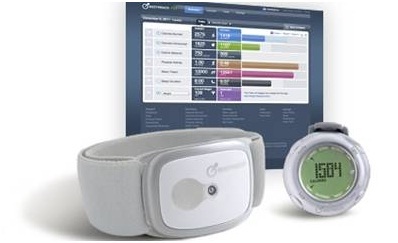 For fitness device partnerships, this growth also offers a huge potential in 2013, ABI noted. A partnership announced between BodyMedia and MyFitnessPal makes tackling weight loss goals a no-brainer by combining data from the MyFitnessPal’s food diary with data from BodyMedia’s armband body monitoring system. MyFitnessPal is a free tool that provides real-time nutrition and fitness tracking, insights and community support for a user base of more than 30 million people who are logging in from their computers, Androids, Blackberry’s, Kindles and iPhones. BodyMedia’s wearable body monitors use physiological data to help users learn to control their weight and be more active. Now it’s possible to automatically transfer the data regarding calories burned right into a person’s MyFitnessPal account. Having a way to see this accurate data together provides a way to really zero-in on weight loss efforts including making better decisions about eating choices and how much exercise is done each day. Also, this new ability to link the two together, according to company officials, was a number one request from users and something that was high on their list of priorities as soon as MyFitnessPal released their application programming interface just recently. "BodyMedia's ability to automatically and accurately measure calorie burn is a benefit to MyFitnessPal users because overestimating calorie expenditure by even a small amount can mean the difference between weight loss and weight gain," said Mike Lee, co-founder of MyFitnessPal. "This integration gives members of our community easy access to vital information to further support their weight control efforts." HealthTechZone had a chance to chat with Ivo Stivoric, chief technology officer and co-founder of BodyMedia, to find out some more about the technology behind their device and the importance of this latest partnership. Ivo said that consumers had been looking to benefit further from what the body monitor, which is registered with the FDA as a medical device, delivered. And because they were already using the MyFitnessPal website to track their daily food intake, the partnership made sense. There has already been excitement building around the new partnership in online forums where people are expressing their happiness that the technologies now integrate. What’s in store for the future? Ivo said their announcement last year around a new disposable patch version of their product has been progressing nicely and it’s something to be on the lookout for in the near future. This offering, Ivo explained, would make it possible for someone to use this lower cost patch as a trial version for up to seven days as a lifestyle assessment tool and then once their session is completed, plug the device into a USB to key in data and see the report findings. From there, users can decide if it’s something they’d like to commit to and opt for the more durable products from the company without have to commit.